Private chef and caterer Courtney Renn and her team specialize in “farm to table” cuisine and creating unique customized menus for 2 to 2,000 guests. Drawing from local, seasonal and organic ingredients, Chef Courtney’s haute Southern fare reflects modern interpretations on soul food classics with an international flair. Having called Atlanta home since 1999, Courtney grew up in eastern North Carolina, taking her first job as a line cook at age 17 in a local seafood restaurant in Wilmington. After receiving her Associate Degree in Culinary Arts from The Art Institute of Atlanta, she dove head first into the Sous Chef position at the 755 Club at Turner Field where she quickly advanced to Executive Chef. This career highlight was followed by a stellar stint at Bold American Catering Company before Chef Courtney revisited her seafood roots at Aquanox. Throughout her career in Atlanta, she has had the opportunity to cook for families, Fortune 500 companies and some of the biggest names in entertainment, including Jennifer Lawrence, Vin Diesel, Whitney Houston, Ben Stiller, Usher and Katherine Heigl. From Southern to Thai, Chef Courtney can design any menu to be the most memorable part of any event. She and her team bring an exceptional level of detail to any occasion, no matter the size, client or budget. Click here NOW to place your order! 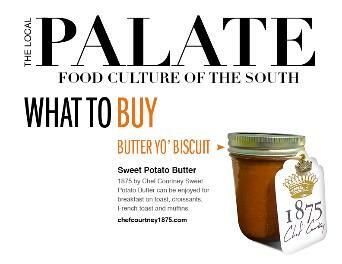 …And now you can bring some of Chef Courtney’s unique Southern fare home with 1875 by Chef Courtney Artisanal Preserved Goods made from centuries old family recipes to be enjoyed in everyday cooking.